Perry's Natalie Martinez (10) watches as this shot against Des Moines North last year sails over the bar. The senior set a new school record with seven goals Friday at Greene County. GRAND JUNCTION — Senior Natalie Martinez rewrote her own Perry school record for scores in a game by finding the back of the net seven times Friday in a 10-0 win over Greene County. The match was played on Karber Field, one-time home facility of the former East Greene. Perry (2-1) received one first-half save from Odaly Perla and a save from Carly Anderson in the second half. While the Jayette defense was stout, the story was Martinez, who ran her career goals total to 79 in her 42 career match. She now has 10 in three contests this season. Martinez started her run with an unassisted strike in the fifth minute, assisting on a Jazmin Hernandez goal four minutes later. Martinez had an unassisted goal in the 14th minute, with sophomore Kailey Crawford scoring an unassisted goal in the 22nd minute. Martinez made it 5-0 at the half off an assist from freshman Hernandez in the 29th minute. Junior Esveidy Hernandez assisted on the fourth Martinez goal of the game in the 49th minute, with Jazmin Hernandez scoring just 25 seconds later as the score moved to 7-0. Martinez scored in the 54th and 57th minutes, the latter off a Jazmin Hernandez assist, with Martinez ending the game with the mercy rule by hitting the net for a seventh time with 18:35 remaining. 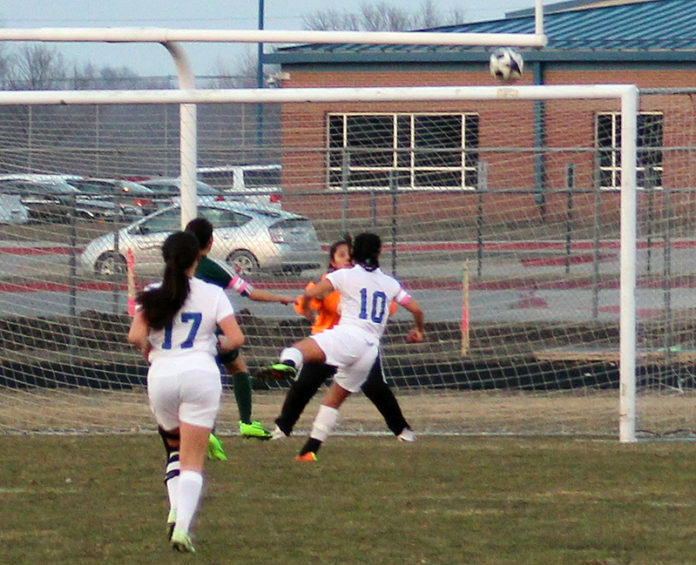 The Jayette junior varsity posted their second consecutive shutout with a 2-0 win over the Rams. Anderson had three saves in the victory. Perry will visit Des Moines North Tuesday and will then compete in the Newton Tournament April 13.